Video Caption: British billionaire [Richard] Branson talks with his typical smile and ultimate optimism. But his body language tells a different story. Seen at second Dubai Government Summit 2014, February 10. Editor’s Note: Another sort of firm prediction from the Virgin Galactic founder, delivered in a not very reassuring manner. Branson has been flawless in making inaccurate predictions so far. At some point, he has to be right, but has that time finally arrived? Confused? No problem. I’ll explain. Let’s first look at where things stand here in mid-February to see if this latest schedule makes any sense. NEW YORK, NY, November 8, 2013 (NBCUniversal PR) — Announced this morning on NBC’s TODAY, NBCUniversal inked an exclusive multi-platform partnership with Sir Richard Branson’s Virgin Galactic, the world’s first commercial spaceline, to televise the inaugural commercial space flight of SpaceShipTwo. 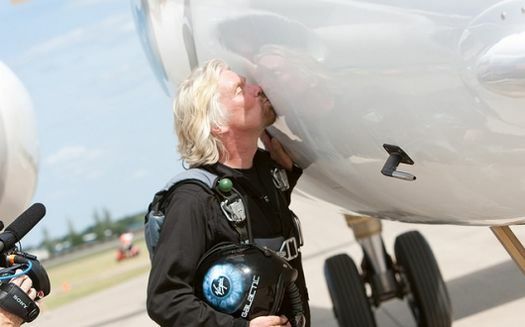 Next year, Sir Richard and his adult children, Holly and Sam, will be the first private passengers to travel into space on SpaceShipTwo from Virgin Galactic’s terminal at Spaceport America in New Mexico. NBC News’ award-winning Peacock Productions will chronicle the journey across a myriad of NBCUniversal brands and platforms including CNBC,MSNBC, NBCNews.com, Syfy, The Weather Channel and more, culminating in a primetime special airing on NBC the night before launch, and a three-hour live event on “TODAY,” hosted by Matt Lauer and Savannah Guthrie.